Francesca embarks on a little seaside research on her way to Fishguard Writers’ Holiday. 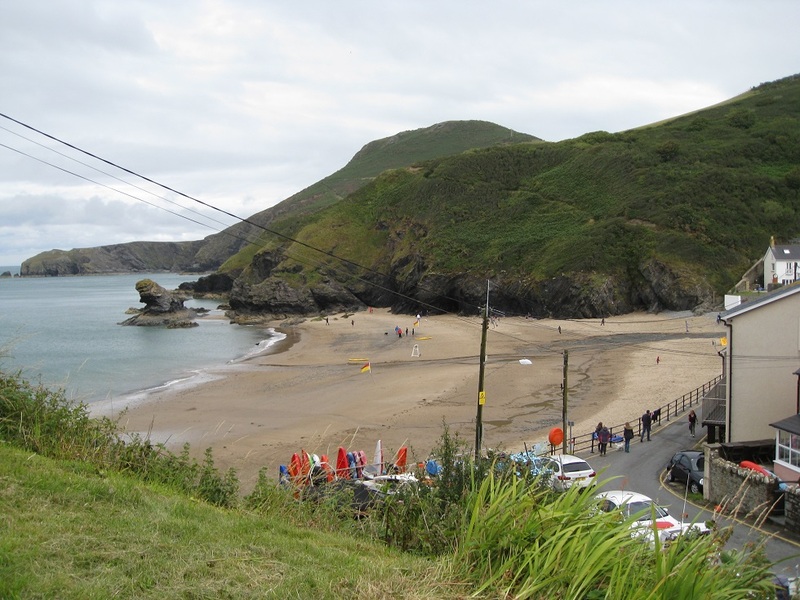 Llangrannog, or ‘Môrglas’: the view from the house of my main character, Tori. 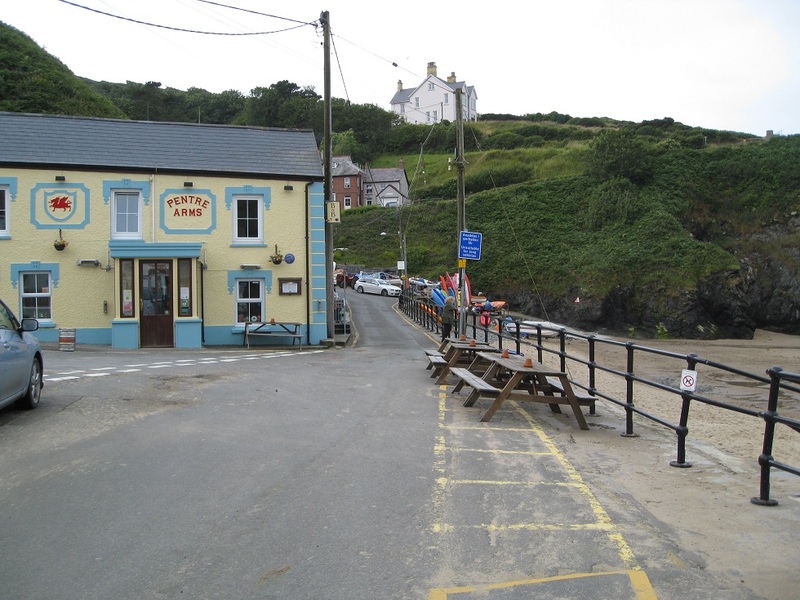 Last week I had a wonderful time at the Writers’ Holiday in Fishguard, my second time at that location but my eighth Writers’ Holiday in all. Coincidentally, it was only a few miles from the village I’m using as a basis for the setting of my latest ‘Work in Progress’. Having only looked at it on Google Maps before, it was the ideal opportunity to investigate the real thing. Armed with my camera and my Welsh language/West Wales consultant (otherwise knows as my friend Angela Johnson! ), I had a good walk around the place, snapping numerous photographs. It was very strange being in a place I’d ‘walked’ around many times on a satellite map, as it really felt like I’d been there before. My ‘WIP’ is about a young woman called Tori, who decides to leave the high life of London and settle down in the sleepy village of Môrglas, a name I made up and which means ‘green sea’ in Welsh. When I was looking for a place on the West Wales coast in which to set my novel, Angela wrote a few ideas down for me. Although I didn’t pick one of them ultimately, they led me to Llangrannog, which is what I based Môrglas on. ‘The Green Dragon’ (Pentre Arms), with Tori’s house just showing behind. Her friend, Ruby, has the large house at the top. Angela can be spied leaning against the railings. I’ve made a few changes to the area – put a hotel where there’s a café, made another café into an Italian restaurant, put a village hall where there are some houses, moved the church from one side of the village to the other and removed a road, for example. I find that picking a place that already exists and changing a few details for the convenience of my story is so much quicker than inventing something from scratch. In a couple of novels I’ve written, I’ve used places I know very well – Worthing and Littlehampton, where I was born and then brought up – but again have rearranged them and renamed them. You might have realised by now that these locations have something in common: they’re all by the sea. As I’ve said before on this blog, I no longer live by the coast and do miss it, so I guess setting stories there makes up for it a little. Out of the four novels and two novellas I’ve completed, along with the ‘WIP’, all but one is set by the sea, and the exception is set near a river (which Littlehampton also possesses). I have writer friends who use real settings with their proper names, either in the present or in the past (which presents its own problems). Other writers I know make up completely new settings or, in the case of sci-fi, new worlds. If you’re a writer reading this, I’d love to hear how you deal with settings, so feel free to comment below. Francesca talks about the inspiration behind her 3-part serial, The Criterion, which begins in The People’s Friend this coming week. I know I’ve mentioned before on this blog how some of my writing has been inspired by my family history. The very first novel I wrote, a Young Adult called Sea Angel, came about because of my own experience working in the family cafe as a teenager. My short story Far From Home, published in the anthology 7 Food Stories from Rome began as my attempt to imagine what it might be like to move to England from Italy as a young widow with a twelve-year-old son, as my grandmother did. The idea for the historical novel I’m currently working on came from a World War One document I found on Ancestry.co.uk detailing the discharge of a Welsh great-grandfather on medical grounds. The first of those is a contemporary, while the latter two both take place in 1915. My serial for The People’s Friend, The Criterion shifts to a different time entirely: 1955. It’s the era of the Ten Pound Poms, and the story begins with my main female character, Gwen Hughes, talking to her disgruntled grandmother about her impending departure to Australia. Renzo Crolla, the male protagonist, owns a cafe in Worthing, The Criterion of the title. The Criterion from her brother. I was born in the cafe twenty-eight years later and lived there until I was nearly four-years-old. My father rented the cafe out for a further seven years. Finally he sold it in 1968. It went on being a cafe for a number of years afterwards, known as the Californian, but today it’s a hairdressing salon. The building itself is Georgian, so what it was originally I have no idea, presumably not a cafe. Perhaps my next project will be to find out something of its history. If I gather enough material I might be able to use it for another story! The Criterion, a 3-part serial, starts in The People’s Friend in the issue dated 27th May. 7 Food Stories from Rome is available here. Shamrock Bear, collected by the children many years ago. Elaine: March is a month where we start to feel uplifted as signs of colour appear on our landscape. Spring has arrived but it also has a couple of celebrated saints days in it. The 1st March was St David’s Day and the 17th March will be St Patrick’s Day. April has St George’s Day and November has St Andrew’s Day. Each saint represents a different country within the British Isles. The title “Saint” usually denotes someone who has been canonised, although in today’s modern language we often use it to describe someone who is regarded as an exemplary model or an extraordinary teacher. Now you may wonder why we have raised this. Well no matter what genre you read or write in, do the saints get mentioned? As we know, the public views these saints in very different ways. So would your characters. Although typecasting would be a little boring, their activities could be a catalyst for things to come. For example in a contemporary novel the characters may have a night out celebrating, which could involve food and alcohol. There could be a scene written for such a celebration. Is a character a mean drunk or a teetotal? Could a crime be committed because of the celebrations, or a love tryst begin? Could the main character have kissed someone and then regretted it the following morning? In times gone by maybe the characters would have been more reverent and celebrated such days by going to church or committing good deeds. All of their actions and reactions would probably depend on their backstory. Francesca: I have an example of using saints in my most recent contemporary novel, set in West Wales. The second day of the novel takes place on March 1st, giving a neighbour of the main character, Tori, an opportunity to welcome her with daffodils and Welsh cakes. It also marks the time of year without being too obvious. Later on in the novel, Tori takes a trip to St David’s splendid cathedral, a good chance for her to get to know the male protagonist, Coel, better. The village I based my imaginary village on has its own saint, called St Caranog. Not wanting to identify too closely with the real village, I made up my own saint, calling him St Dynogof. The church there is named after him, another setting where things happen in the novel. I had fun making up his story, based loosely on that of Caranog’s and a couple of other Welsh saints, and he plays a small part in the novel. I have lots of ideas for future stories set in my made-up village of ‘Môrglas’, and dear old St Dynogof might get a further role in one of them. Probably not what St George’s dragon was supposed to look like! the past. But it does depend on the time, the place and what denomination of people you’re talking about. The historical novel I’m currently writing is set in a Welsh mining town in World War One. There would have been a lot of nonconformists and therefore people who were less inclined to celebrate saints’ days. Many of the incomers from England and Ireland (and there were quite a few here at this time) would have been Anglicans and Catholics, so would have taken a greater interest in saints. Maybe it would have even caused some friction? It’s certainly something to consider. Dydd Gŵyl Dewi Hapus Lá fhéile Pádraig sona dhuit Latha Naomh Anndra sona dhuibh and Happy St George’s day! Francesca’s been investigating the death certificates of her ancestors in the hope it will help her with research for her novel. For anyone who’s been watching the TV series, Poldark, you’ll know that one of the characters died of something they called ‘putrid throat’. (I won’t say which, in case you haven’t caught up with the first series.) This revolting sounding affliction, it would appear, is what we in modern times call Diphtheria. There have been other names for it over the centuries like ‘putrid fever’ and ‘membranous croup’. Although I tend to write more contemporary then historical fiction, I’ve recently been writing a novel set in 1915. In it, one of the characters, a young woman, dies, and I’ve had to consider what might be the cause. Her mining village is based on the one some of my ancestors lived in around this time, so I thought this might be a good place to start. A couple of years ago I ordered a few certificates – birth, marriage and death – from the General Register Office, having found several family members on an ancestry site. I discovered that three of my female ancestors – my great gran’s mother (M), sister (S) and daughter (D) – died at age 42, 16 and 28 respectively, in 1891, 1899 and 1935. ‘D’ in c1932, with her first child. S is recorded as dying with phthysis, D with phthsis pulmonales, while D died of pulmonary tuberculosis. Clearly the last one was TB, but I was surprised to discover the first two were also. TB is clearly a strong contender for the death of my character. But why did so many people contract it? What conditions caused it? Was it rife in that area? Why did it only seem to strike the women in my family? These are all aspects to look into to make my story stronger. It seems unlikely that everyday Victorian folk referred to the disease as phthisis. More likely they called it tuberculosis, TB, or consumption. Other terms over the years have included lung disease, scrofula and white plague. Looking at death certificates for the other side of my mother’s family, I’ve discovered one great-great grandfather died in 1892, aged 46, of apoplexy. Until I read that, I thought apoplexy was a description of someone getting extremely angry. Medically it’s a type of stroke. Worth remembering. His son died on the operating table aged 36, in 1927, during a second operation for appendectomy complications. Talking to a friend about it she asked how it would have been paid for before the NHS came into being. Good point. The 1911 National Insurance Act provided only basic medical care. This great grandfather was also a miner, and I believe that hospitals were often provided by mine owners or jointly by them and workers via subs. Could they have paid for him to go to the Cardiff Royal Infirmary for the op? Perhaps my family simply had some savings? Considering all this has certainly thrown up more questions than answers so far. Finding out what they died of is only the beginning. There is much scope for research. Great Gran, c 1964, who suffered much loss in her long life. If, like me, you can mine family records, (sorry, no pun intended), they can be a good start for research. A word of caution: discovering family deaths and their circumstances can be harrowing. I cried when I found out why sixteen-year-old S had disappeared from the census. I cried again when the certificates confirmed my mother’s story of not only D’s death from TB, but that of her prematurely born baby a month later. I try to imagine how Great Gran must have felt, losing all those family members. She was ninety-seven when she died, but never talked about it. She also lost a toddler son in 1922 and two other sons in World War Two. Life was cruel. Perhaps if I can inject a little of that emotion into writing about a character’s death, I’ll not go far wrong. A big thank you to my cousin Janine who lives in Australia. She also has undertaken much interesting research into our shared family. Another word of caution: if you’re interested in finding your ancestors’ certificates, whether death, birth or marriage, the various ancestry web sites are a good place to start, but don’t buy them from those sites, as they’ll cost you three times as much than they will from the General Register office, which you can find here. Another interesting web page about old names for illnesses, The Glossary of Old Medical terms, can be found here. It’s Only Words, Isn’t It? As the new term gets started, Elaine and Francesca think about their writing year ahead. September and the new school year is upon us. For some it is a momentous occasion, with children going into the next level of education. Whether their son/daughter has gone from nursery to reception or from sixth form to university, or anything in between, many tears have flowed. Just as it’s a new beginning for the children/grandchildren, so it is for the writers amongst us. It’s a challenge, getting back into the swing of sitting still long enough to write some words, after the hustle and bustle of the summer holidays. Elaine: Earlier this month I attended the Historical Novel Society Conference and a Woman’s Weekly workshop on historical writing. Although they were obviously very different, both were a first for me. I gained something from both of them but what astounded me more is that I know more than I realised; it is clearly about putting that knowledge into practice. My Victorian Saga is technically finished and out trying to get snapped up, although I am sure changes will need to be made. While I am waiting for those decisions, I am planning my next novel. That means I am up to my neck in research, learning some fascinating facts that I hope I can slip into my novel. It’s pretty safe to say there have been times when I thought my head would explode. I have paper and Post It Notes everywhere. Luckily for me, I have an understanding husband because while I have an office, I have also commandeered the dining table as well! Francesca: It always seems that I start new novels in September, as if studying for a new course. I guess this is because of sending novels off to the RNA’s New Writers’ Scheme several summers in a row. Francesca’s historical idea came from an incident in her grandfather Islwyn’s family. Like Elaine, I attended the Woman’s Weekly workshop on historical fiction. Although I tend to write contemporary novels, and have just started a new one, I’ve had an idea for an historical bubbling away for some time that the workshop helped me develop. So which to continue with? Because I did a history degree back in the dim distant past, several people have asked me why I don’t pursue that genre of novel. I have written several historical short stories and a serial, but I always seem to come up with masses of ideas for contemporary novels. It would be interesting to proceed with the historical, though there’s a danger I’ll get carried away with the research, for which I’ve acquired several books! My other goal is to return to short stories. In the past I’ve had sixty-odd ‘out theres’ sent to various magazines, but I’ve sadly neglected them in favour of novels recently. And I’d like to write another serial. Time to just get on with it, because as Bruce Lee once apparently observed, ‘If you spend too much time thinking about a thing, you’ll never get it done.’ Good luck with your own ‘new term’. Do you have plans for the new school year or are you just enjoying the peace and quiet? Don’t They Know It Isn’t Christmas? As the summer holidays end, Francesca and Elaine wonder whether it’s too soon to get ready for Christmas, particularly as a writer. And how do we get inspired by snow in the middle of a heatwave? Elaine: In the middle of August I went shopping for birthday cards and you can imagine my dismay at finding several shelves already filled with Christmas cards, but what is worse than that is that I was actually tempted to buy some, but deciding it was all a bit crackers, excuse the pun, I didn’t. Since then, I have seen adverts for Christmas items in sales; although they are probably old stock, it does beg the question how early should the commercialism of Christmas start and does it get earlier each year, or is it just me getting older? Francesca: Ugh, don’t get me started! If Christmas didn’t appear in the shops before December 1st, I’d be quite happy. I was talking to a fellow writer, Ann, about it this evening, and she suggested after Bonfire Night was okay, which I guess is reasonable. And there are certain things that need to be considered ahead of time. Elaine: A cook will plan ahead to make the cakes and puddings along with pickling onions. A writer also needs to have one eye on the calendar so he/she can plan accordingly. If you are a writer of short stories, then now is the time to be considering sending them off to be included in December editions of magazines. If you write novels, and they are going into paperback, then you are too late for this year. Francesca: Of course some magazines will already have their stock of Christmas stories ready; the time for submitting seems to get earlier each year. I think the latest I’ve sent in a Christmas story is November, after a call out. It’s worth checking with the magazine. But as you say Elaine, it’s definitely too late for a Christmas novel this year. How on earth does one go about setting a story during winter celebrations when it’s still summer, especially in the middle of a heatwave? Elaine: To get into the mood for writing a Christmas story, you can obviously draw on memories, or watching films can inspire you. A few of my favourites are It’s A Wonderful Life, Love Actually and Miracle On 34th Street, all feel good films that spread the love. Music is also a good way of setting the mood. Playing Christmas carols or the usual pop songs that get wheeled out every year definitely gives the feel good factor. Francesca: Miracle on 34th Street is a favourite of mine too (the original version, with Natalie Wood), but I also love The Muppet Christmas Carol. Despite that, watching either during the summer is something I would personally find quite annoying. Ditto Christmas songs. Christmas photos might be a good place to start, especially if you have boxes / files full as I do. I have been known to decorate the dining room with lights and table decorations to evoke the mood in August, before sitting at the table to write. Yes, you heard it here first – I am quite mad! Apparently Selfridges opened their Christmas shop on August 1st this year. Now that is barmy. But if you’re desperate for inspiration it would be a great venue to hang out in and jot down some ideas. There’s also a place called the Icebar in London’s Heddon Street, which I visited a few years ago. Fascinating. Cold. Perhaps inspiring. Difficult to write anything down though when you’re having to wear a thick coat and gloves! Elaine: Of course, you could just use this year’s celebration to write and get a novel published in time for next year. Family photos, a good source of inspiration – what are this lot up to? Francesca: Indeed. Ultimately, the best time to write Christmas fiction, whether a novel, a short story or a serial, is at Christmas. Obvious really. One year I managed to write three Christmas stories during December and it was so much easier than doing it in July. It’s a matter of getting organised. It also helps to put a note somewhere to remind yourself to send them off when the time’s right, as it’s very easy to forget about them. Tell us, how do you get inspired to write seasonal stories at the wrong time of year?